We marvel at the Notre Dame Cathedral, the Florence Duomo, St. Peter's Basilica, and St. Paul's in London, but hardly anyone would recognize the equally stunning medieval Cathedral of Pisa, because all we ever see is its leaning bell tower. In fact, some people don't know that the leaning tower belongs to a church but rather think it's a public building of some sort because it is free standing. The Italians often built free standing bell towers and in fact have a name for them: campanile. St. Mark's Campanile, one of the most recognizable symbols of Venice, is the free standing bell tower of St. Mark's Basilica. Don't short change yourself by zipping through the city of Pisa only long enough to climb the leaning tower and move on. 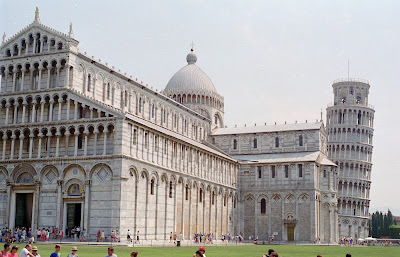 The Piazza dei Miracoli ("Square of Miracles") where it stands is one of the main centers for medieval art in the world with four great religious buildings inside its walled area. It's easy to spend an entire day in awe there, even with kids, since the square's wide grassy lawns provide ample room for everyone to take a break, run around, or enjoy a picnic. The massive Duomo in the heart of the square was begun in 1064 and has an elaborately impressive columned façade and a dramatic interior with black and white marble, a gilded ceiling, and a frescoed dome. The carved pulpit is considered a masterpiece of medieval sculpture. Strong Byzantine influence can be seen in the mosaics and pointed arches throughout the cathedral. Go inside! 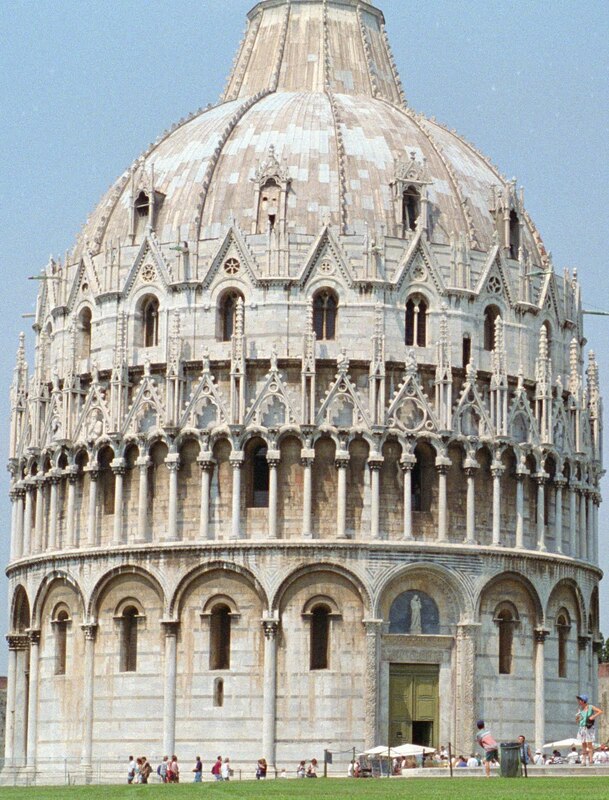 Interestingly, the cathedral baptistry is also free standing in the Piazza dei Miracoli and is the largest baptistry in Italy. It sits like a dollop of whipped cream at the west end of the cathedral. 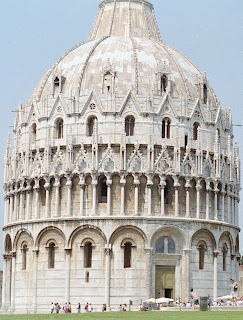 You might notice it tilts a little too, as do many of the buildings in Pisa. The interior is enormous, but somewhat plain. Lastly, the Campo Santo cemetery lies within the square and is beautiful to visit. The Gothic cloister building contains marvelous 15th century art, sculptures, and frescoes, and there is an inner court with elaborate round arches. It can also be a peaceful respite from the crowds around the bell tower - this might be where you want to have your picnic when you spend the day in Pisa! I agree. The surrounding area is beautiful. We had planned just to climb the tower, but none of the kids were old enough, so we had some time to explore. Of course, the kids say that means we need to go back. I agree with that too.